Declarations of Independence: New Countries in 2014? 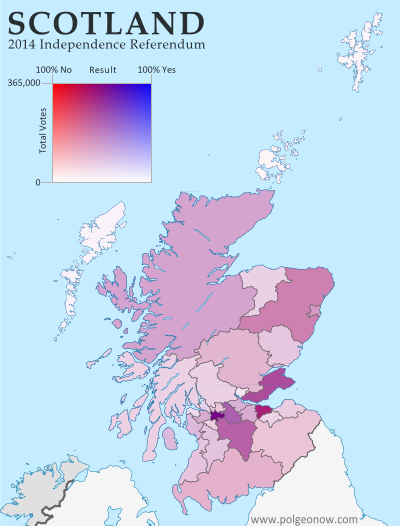 Scotland passed up its chance to become the year's only fully-recognized new country, but 2014 saw no shortage of attempts at independence. Catalonia held a non-binding vote on separation from Spain, and separatists in Venice conducted a large-scale online poll on leaving Italy, but both were symbolic attempts that saw little participation from opponents. See Also: What would have happened if Scotland voted to leave the UK? Actual territorial control of the "Donetsk People's Republic" and "Lugansk People's Republic"
The most successful declaration of independence in 2014 was that of Crimea, where rebels and Russian troops overthrew the local administration and declared independence from Ukraine. 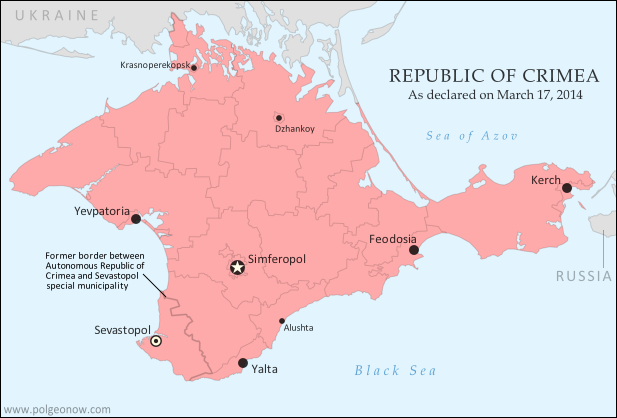 Official diplomatic recognition from Russia lent this "Republic of Crimea" a brief boost in official status, putting it roughly on par with established breakaway Northern Cyprus (which is recognized only by Turkey, and came about in a similar manner 40 years ago). However, Crimea's new administration claimed sovereignty for less than a week before voluntarily merging into Russia. See Also: Was Crimea Really a Country? 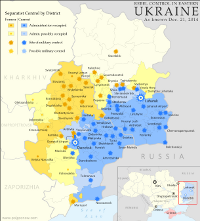 The Ukraine conflict has also seen the emergence of two more aspiring countries, the Donetsk People's Republic and Lugansk People's Republic, sometimes unified as "Novorossiya". Neither is recognized by any other country (except fellow breakaway South Ossetia), but extensive territorial control lends their claims a degree of fact, if not official diplomatic status. The "Islamic State" took over much of northern Iraq in 2014. Not to be forgotten is the so-called "Islamic State", declared in June by the extremist rebels formerly known as the "Islamic State of Iraq and al-Sham" (ISIS or ISIL). 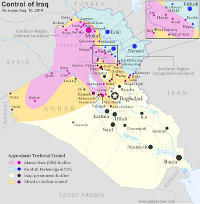 The group began seizing full control of populated territories in late 2013, and by the end of 2014 they controlled an enormous chunk of former Syria and Iraq. Claiming to be the modern "caliphate" (empire of all Muslims), the Islamic State is in some sense an independent country of its own, despite fierce objections from the international community and many of its own would-be "citizens". Rebels in Nigeria and Libya attempted to piggyback on the Islamic State's success by speaking of "caliphates" and "emirates" (small kingdoms), but it remains to be seen how serious they are about formal independence. Meanwhile, a rebel independence claim in the Central African Republic fizzled out after the group's own leadership declined to endorse it. Though each serious in its own way, Greenpeace's declaration of a "Glacier Republic" in Chile, a U.S. man's quest to make his daughter a North African princess, and several symbolic independence declarations by Australian aboriginal peoples were all ignored completely in diplomatic circles. Unlike in 2013, no existing countries seem to have changed their official names last year. Nor have any flag changes come to our attention, though it often takes some time for small flag modifications to reach our ears. The World Trade Organization got a new member in 2014. 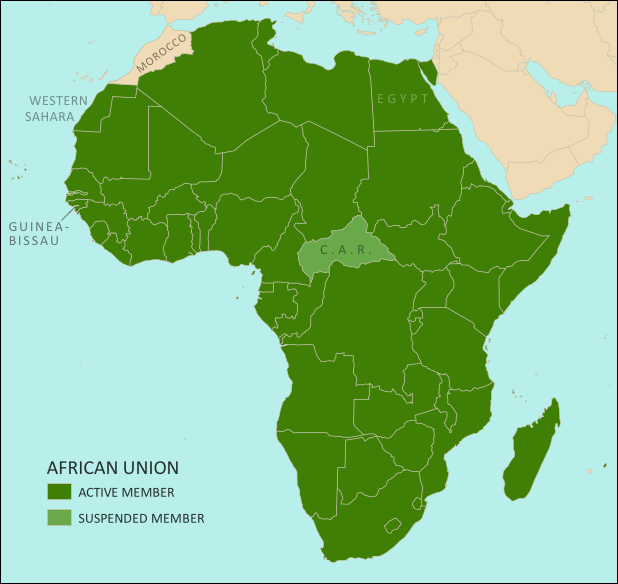 Three countries were un-suspended at the African Union in 2014. Other than Crimea (see above), several of the world's other partially recognized countries also saw changes in recognition in 2014. Kosovo is now recognized by every country in Oceania. Kosovo still led the pack in diplomatic recognitions, with four more countries recognizing it as independent from Serbia, though that's down 50% from the eight recognitions it received in 2013. Palestine only received one diplomatic recognition (down from two in 2013), but it was an important one: European Union member Sweden. Western Sahara saw no net change in its number of active recognitions, with Mauritius "withdrawing" recognition and Paraguay's recognition "suspended", but Kenya and Malawi apparently resuming theirs. Withdrawing or suspending recognition is a legal gray area, since recognition of a country (as opposed to a particular government of that country) is usually considered irrevocable. However, Tuvalu did something similar in 2014 as well, backpedaling on its 2011 recognition of Abkhazia and South Ossetia (both of which claim independence from Georgia). Crimea is now disputed between Ukraine and Russia. The biggest change to the world's territorial disputes in 2014 was the creation of a major new disputed territory: Crimea. This region was universally recognized as part of Ukraine at the beginning of the year, but after a swift military campaign in March, it's now a territory administered by Russia and claimed by Ukraine. In addition to Crimea, Russian president Vladimir Putin hinted at another new territorial dispute, suggesting that all of eastern and southern Ukraine, which he referred to by the historical term "Novorossiya" ("New Russia"), should really be part of his own country. Elsewhere, local disputes arose during the process of marking out the border between Nigeria and Cameroon, while Iraq and Iran agreed to put to rest a border dispute over the Shatt al-Arab river mouth. 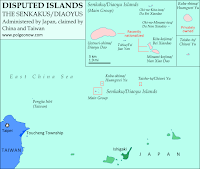 Beyond Crimea, China dominated the list of high-tension disputes in 2014, facing off with Vietnamese and Philippine forces in the South China Sea, and sending troops into an area disputed with India, but joining with Japan in a cooling of 2013's heated jockeying over the Senkaku/Diaoyu islands. India, however, saw even greater border strife in the long-disputed Kashmir region, which saw the worst fighting in a decade between Indian and Pakistani forces. Another notable development affected one of the world's more unique territorial disputes: landlocked Bolivia's assertion that Chile owes it land with a coastline - any land with a coastline (Bolivia claims no specific rightful border). In 2014, Bolivia took Chile to the International Court of Justice over the claim, and Chile appears to be cooperating, feeling that the facts are heavily in its favor. However, the verdict could take years to arrive. Boko Haram now controls parts of Nigeria. As mentioned above in "Declarations of Independence", 2014 saw the seizure of major areas of Ukraine, Iraq, and Syria by rebel groups. 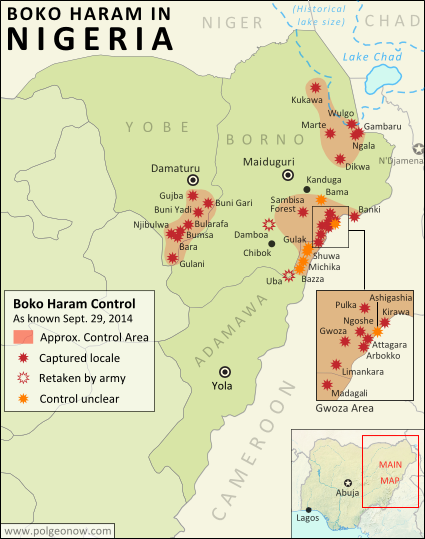 Beyond those three cases, the next most-reported was perhaps Nigeria, where Boko Haram rebels made a spectacular resurgence after having lost territory they briefly controlled in 2013. The group now controls more territory than ever before, and is having a degree of success holding it against the Nigerian government. South Sudan spent 2014 split by civil war. South Sudan also saw a major increase in rebel control, as the civil war that began in late 2013 reached its peak a couple months later. Meanwhile, Yemen's Houthi rebels, who have administered the country's far northwest for years, advanced as far as the national capital of Sanaa. Separatists in northern Mali also claimed to recapture some towns in 2014, but negotiations are ongoing, and there was no repeat of their major takeover in 2012. Conflicts in the divided countries of Somalia, Sudan, the Democratic Republic of the Congo, and the Central African Republic dragged on into 2014, with major areas of each remaining under rebel control, while a similar situation prevailed in Myanmar (Burma). There were major events in the claimed State of Palestine during the past year as well, with the West Bank and Gaza Strip nominally reunited in a peace deal between rival political parties Fatah and Hamas, but parts of the Gaza Strip temporarily re-occupied by Israel during a war between Hamas and that country. Overflow from the year's major conflicts also saw small-scale seizures of territory in Lebanon by Syrian rebels, and in Cameroon by Boko Haram rebels from Nigeria. It was less clear whether activity by rebels in Mozambique and anti-cartel vigilantes in Mexico constituted real territorial control. Jurisdiction over much of the world's oceans is still unresolved, with neighboring countries often disagreeing on where the lines fall between their respective waters, which include both territorial seas (a thin strip along the coast) and exclusive economic zones (EEZ; a much wider band where they have economic control but not full ownership). However, 2014 was a relatively big year for settling these maritime boundaries. 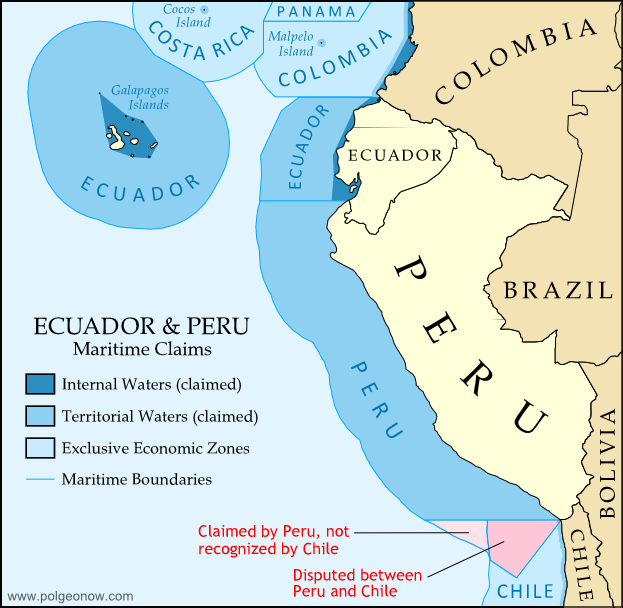 Peru and Chile's maritime dispute was settled in court. 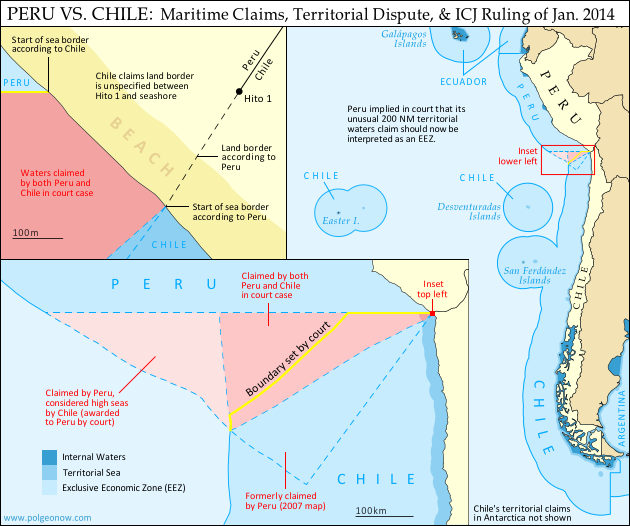 In January, a long-standing dispute between Chile and Peru was resolved by an International Court of Justice (ICJ) ruling, in a partial compromise that largely favored Peru (in-depth map and report). A similar dispute between India and Bangladesh was settled at the Permanent Court of Arbitration in July, with the ruling mostly favoring Bangladesh. Meanwhile, a number of countries signed treaties to resolve their own sea border issues. Germany and the Netherlands agreed to jointly govern a long-disputed bay, Lithuania settled its final undefined sea border with Sweden, and the Philippines and Indonesia drew the line through a once-disputed area of sea between their respective islands. The Netherlands also signed a boundary treaty with Caribbean island country St. Kitts and Nevis (which lies close to the Dutch island of Sint Eustatius), and long-overdue boundary treaties were signed by Ecuador and Costa Rica (see map below) as well as Russia and Estonia. International law allows countries to claim rights to resources on the "continental shelf" well beyond the 200 nautical mile limit of their EEZs, and many countries were still in the process of doing so in 2014. Toward the end of the year, Greenland and its patron country Denmark made news by formally claiming a large area of seabed under the North Pole, in what will likely lead into a dispute between several arctic countries. Formal continental shelf claims were also filed by the Bahamas, Tonga, and Somalia, while Spain and France submitted claims connected to their outlying islands in the Atlantic. The West African countries of Cabo Verde, The Gambia, Guinea, Guinea-Bissau, Mauritania, Senegal, and Sierra Leone made a single joint submission of their claim to the UN, defining the seven countries' collective continental shelf without saying where the lines between each country's piece would be drawn. The UN commission that administers continental shelf claims stamped its final approval on a 2009 claim by Ghana and partial claims by Russia and Denmark. Though creating a new U.S. state is a major legislative ordeal, some countries' provinces and other divisions are created, redrawn, or abolished at will. The many changes to the world's administrative subdivisions can be hard to keep track of, but luckily we have the wonderful Statoids website to help with that. In 2014, Crimea took the spotlight for subdivision changes as well as other political geography categories, with rebels declaring the region independent from Ukraine, then with Russia creating two new subdivisions to accommodate Crimea's merger with that country. But India also made news with the creation of a new state, Telangana, while Panama, Egypt, Mauritania, and Montenegro all created new provinces or equivalent divisions. Bahrain also eliminated one of its provinces, while the nearly-independent Kurdistan created a new province within Iraq. In Ukraine's 2014 political strife, not even the clocks were safe. The past year also saw some changes to the world's time zones. After controversially joining Russia, Crimea switched from Eastern European Time to Moscow Standard Time, setting clocks two hours forward to account for its simultaneous time zone switch and exit from daylight savings time (DST). Not long afterwards, Russia overhauled its whole time zone system, returning to its pre-2011 system of 11 zones (from 2011 to 2014 there were only nine zones) and changing the practice of seasonal time changes. Eastern Ukraine's self-declared Donetsk and Lugansk People's Republics also followed suit with Crimea, though their change (like Crimea's) may not be recognized by the Ukrainian government. Papua New Guinea also added a new time zone, with its eastern island of Bougainville jumping forward an hour to sync with neighboring Solomon Islands. The British Caribbean territory of Turks and Caicos decided to stay permanently in daylight savings time from 2014 onward, and Egypt reinstated DST after a three-year break, but with a temporary suspension during the Muslim holiday of Ramadan. Meanwhile, a number of countries adjusted their dates for the annual beginning and ending of DST. What major political geography events will happen in 2015? Stay tuned to PolGeoNow for quality maps and reporting! Also, don't forget to follow us on Twitter for extra reporting on world events, and add us on Facebook or Tumblr to get updates when new articles are published!